Even Jose Saramego, winner of the Nobel Prize for Literature, was enchanted by the story of the elephant’s journey, so much so that he then wrote a book inspired by the tale. This story began at the end of 1551, when an elephant complete with a large entourage stopped off in Brixen and stayed there for 14 days. It was a gift from the Portuguese King John III to his nephew, Archduke Maximilian of Austria, and was on its way from India to Vienna. At that time the exotic animal was a sensation: it was applauded by bishops and cardinals in Trento and received in triumph in Bolzano. In Brixen, too, the townsfolk formed a guard of honour. It is no surprise that the elephant left a lasting impression: today’s Hotel Elephant continues to have a similar effect on its guests. The story of the elephant's journey: A true European miracle. Nowadays the memory lives in: In Linz (Austria) and Wasserburg (Upper Bavaria) but also in Austria's capital Vienna historic monuments proof the presence of Soliman around 500 years ago. The 16th century's owner of Hotel Elephant, Andrä Posch, soon renamed the house after the elephant continued its journey towards Vienna. 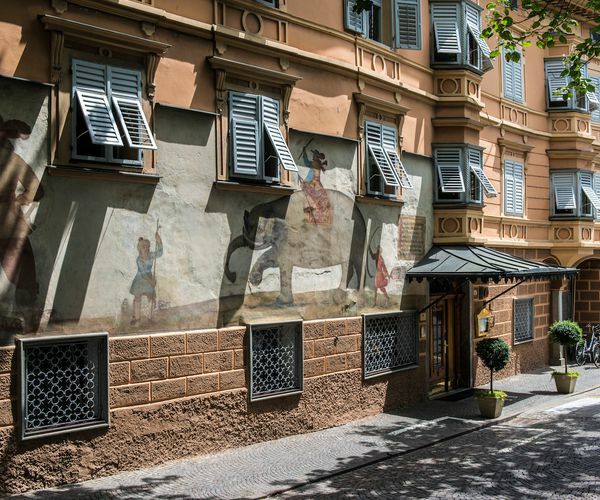 To underline the incredible story a colourful fresco was painted on the house wall to show the posterity what happend here 1551.